So here it is. Cute little profile of our baby. I had my ultrasound yesterday. You know after having my son, I go to ultrasounds with a great deal of excitement and a small part trepidation. I had a lot of ultrasounds with Hunter because they were monitoring an irregular heartbeat that he had. It turned out to be nothing when he was born. However, you don't forget that nervousness and fear when you go in for the next one. Of course the overriding feeling is of excitement because you get to see your baby's face, little hands, little wriggles and movements. It's instant affection and love. I was hoping to find out if it was a boy or girl. FAIL. This little one was too shy. 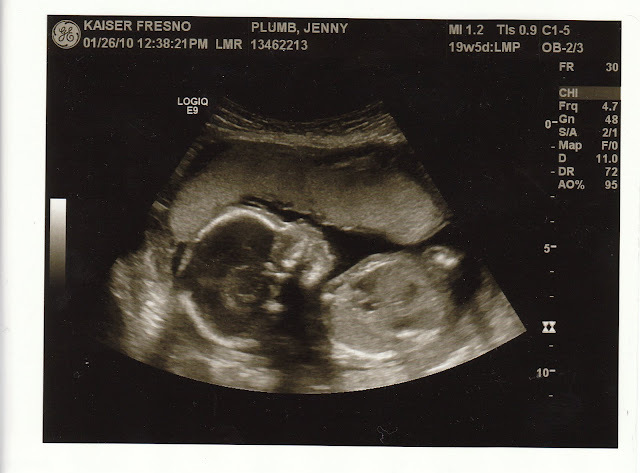 The ultrasound tech thought maybe a girl, but got another tech who couldn't tell either. So I got a "maybe" which is really a "nothing". I just wasn't prepared for that. I have about 8 friends who are pregnant right now and they all know for sure. Not that I need to be like them, but I was disappointed and a bit surprised that they couldn't tell me. Now I really wanted a boy, so I am laying there and feeling lame for even feeling a letdown when I was told girl. I mean, any child is a wonderful gift from God. But I felt letdown just the same. I was a little depressed walking out of the office. Today reality jerked and became a different reality for me. The doctor called. There looks as if there is the possibility of fluid around the spine. She highly recommended I go in tomorrow for a blood test and get another ultrasound in the next week. I was having trouble with tears crowding my voice when I asked her what were the indications of this news. The blood test is to see if it correlates with the ultrasound. They are specifically looking for spina bifida. Many thoughts cross your brain: This is routine right? It'll be just like Hunter. I bet a lot of people go through this only to have a healthy baby. Did I do something wrong? What if it was because I was too sick to take my prenatal vitamins because they made me throw up? But I ate a salad and healthy food every day to make up for it because I know that I needed the folic acid in the leafy greens. Odds say 7 out of 10 neural defects could have been solved by taking more folic acid? Of course it's not my fault, these things happen. I could be in the 30 percent. Maybe they can see if it's a boy or girl next time. How can I even think about it's gender when there are greater things at stake? Why was I not just happy it was healthy? Am I a shallow parent? How will I handle a child with spina bifida? It doesn't matter, I saw this child and it makes no difference in how much I love it to me. But really? How will I handle a child with spina bifida? Moments of fear and tears are followed in the next second by calm and confidence, only to feel tears again a little while later. Thoughts go round and round. One thing that never changes is how much I fiercely love this child and know I am fortunate to have been given this gift. You know, my God is good. My God is great. The results do not diminish His goodness or greatness. I do feel a great sense of calm in the middle of tears knowing this. I know that in the middle of life as I am daily confronted by the "wreck of me" and my struggles, successes and failings, He is the gracious and constant one. He cannot continue to be but the same. I live in the mantra of "worry doesn't empy tomorrow of it's sorrows, it empties today of it's strength" - Corrie Ten Boom. I have it posted in many places in my home. Not because I do it so well. Rather, I do this so poorly I need the daily reminder. The reminder that God is my continual source of strength. My ever present help in times of trouble. You are in my prayers! I hope next week's visit is filled with good news, but regardless God is good even when it's hard to see what's going on. I will keep you guys in my prayers. Praying for you Jenny. I love you my dear friend. in our hearts and prayers. Please let me know if you need anything. I'll be praying, Jenny! Your post said it well also, but I am continually remembering this lesson from Job: God is in charge, and that's all that matters. :) He is good and He will take care of us no matter what He takes us through. Sometimes it is when we go through great trepidaton that we feel the most comforted and certain of the presence of God. Praying it is so for you. I have your Corrie Ten Boom quote in my bathroom, and I think of you when I read it. Amen, Sister! My heart is breaking for you as I read this blog entry as it brings back so many memories of when we received that call from the doctors. All of your feelings are understandable. Having a child with SB is a scary thing but I can assure you that the pregnancy is by far the hardest part. Once you have your beautiful baby in your arms your natural motherly instincts will kick in and you will do everything possible to care for and protect that baby. I can see from your blog you are a loving special woman and if indeed your baby has SB you WILL BE OK, butter than OK actually - I assure you. I guess I should introduce myself - my name is Nicole Summers and I am a stay at home mother of 3 beautiful babies ages 6 mos to almost 5 and we live in So. CA. Our youngest, Annabelle Grace has Spina Bifida and Hydrocephallus. She had 4 surgeries within the first few months of her life and she is such a joy. She has added so much to our family. Please feel free to check out our family blog and Annabelle's baby book blog if you would like. I won't pretend that life is easy, but clearly, being a mom you know already that it's never easy. I will be praying that your baby is healthy and happy and that you and your family have the strength to deal with whatever lies ahead of you. PS - we have a SB support group on babycenter.com (Spina Bifida Kids) if you feel like checking it out down the road. sorry for all of the misspelling :-o I was typing, nursing and helping my 3 year old - oops!